More than half a dozen places have claimed him as a native son, and although Herodotus records that he was killed by citizens of Delphi, he gives no indication of motive. 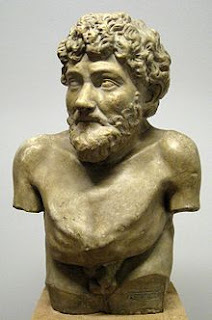 Aesop’s fables were brief stories, appropriate for children and structured around a simple moral lesson. Most of them featured anthropomorphized animals— animals who spoke and acted like humans, often motivated by some exaggerated human characteristic. Unlike the animal tales of many mythic traditions—the Coyote stories of North America, for instance—Aesop’s animals did not represent spiritual or divine beings, nor did they explain the nature of the world. They were comparable instead to modern children’s literature and cartoons, though with an educational bent. The Ant and the Grasshopper, the latter of which suffers through a harsh winter he had not prepared for as the ant did; and perhaps most evocatively, The Scorpion and the Frog. In this tale a scorpion asks a frog to carry him across the river, and when the frog refuses out of fear of being stung, the scorpion brushes the concern aside, pointing out that should he sting the frog, both will die as the scorpion drowns. Nonetheless, the frog’s fear proves warranted—when the scorpion stings him partway across the river, he reminds the frog that such behavior is plainly the nature of a scorpion.